“What does The Compost Gardener do?” I was recently asked on my newest Google internet listing. The closest two choices I had were Gardener, and Landscaper. Both are accurate, and neither are spot on. A friend asked me the same question and I had to consider what I do for people in their gardens that makes me a gardener for hire. I think most gardeners hire themselves out to do the work their clients tell them to do, but I am the gardener you hire to tell you what should be done in your garden. Most of my clients want to incorporate edible crops into their gardens. They want to do this without using pesticides and bags of synthetic fertilizers. 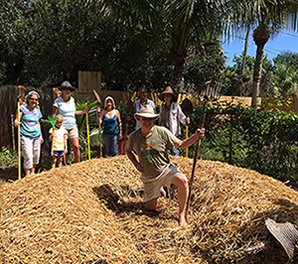 So, I come out with some of my favorite tools, some seeds, some plants, and if requested a load of composting manure, or mulch, hay and or straw, and I work side by side with my clients to teach them how to garden in a new and healthier way. How do I know what to bring with me? Because I have been there once before for a Garden Consult. The Garden Consult is step one in my relationship with my clients, I come to their gardens to take a look. We talk about what is happening currently, how the client hopes the garden will develop, and we talk about how to make that happen. For some clients that is enough. They can go from there and do their own work. In that case step one, the Garden Consult, is the only service I may provide for that customer. After the Garden Consult some clients who do not have a pick up truck hire me to delivery manure, mulch, hay and straw to their gardens. I do that too. My long term clients hire me to come with various garden amendments, and I work with them in the garden until they are confident with the methods we employ to build their soils and manage their plants and harvests. One of my favorite clients, a long time gardener long before we met hired me to work beside him for nearly a year. It took him that long to believe he could do the things we were doing together by his lone, but he did, and he does great work in his gardens now without my help. It is one of my greatest successes that my clients don’t generally need me for long. It is the way I know that I am teaching simple and successful methods for long term garden management. I am the gardener you hire when you need someone to tell you what’s next. Edible, sustainable, regenerative, clean and naturally delicious for Florida! A year of Adina’s guidance completely transformed my yard into an edible landscape! The Layer Mound Gothic pic was taken after a class last summer and the bed kept me & my friends and family in lettuce, kale, onions, cabbage, collards and now has cayenne peppers growing in it! I highly recommend having Adina “Tell you what to do in your garden”! I agree with Mark wholeheartedly. I have known Adina and her landscaping work for too many years to count. What counts is that she is the best–thorough, thoughtful, artistic, and a listener. Thank you Mark. Mark is a great client. He learned how to garden the natural way, and he never looked back. 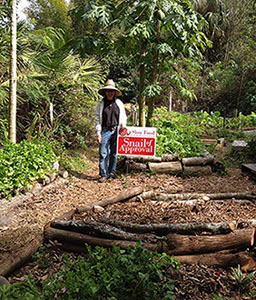 He and Sandy maintain a gorgeous and ever changing food forest landscape on his property.